Now everyone is starting to plan and book their holidays, we’ve conducted some research to discover the most family-friendly beach in Europe – we created a Family Beach Index to rank our findings – and Crete is the overall winner. We scored and weighted five criteria which matter most to families when choosing their beach holidays – warmest average temperature, warmest sea temperatures, shortest flight times, most family-friendly attractions and best value for money. The Greek island topped our index and it’s a no brainer why it did. It’s time to celebrate all that Crete has to offer and why it’s a great choice for family holidays. It’s the largest of the Greek islands, welcoming over four million visitors each year. At around a four-hour flight from the UK you’ll be on the beach in no time – the island has a lovely average temperature of 24C and an average sea temperature of 23C. You’ll be toasty on the beach and rocking a great tan – it’s enough to spark the jealousy in everyone back home. Beach-lovers searching for the ultimate beach break need to look no further than Crete. It has a solid mix of picture-perfect sandy beaches, charming towns, unlimited entertainment and amazing food -feast your eyes on fresh fish, Greek salads with olives and feta cheese, Loukanika (Greek sausages) and moussaka. There’s something for everyone. Being an island, there are so many sandy beaches and secret coves – perfect for beach bums and exploring. Why not make your mates green with envy once you tell them you’ve been to a pink sand beach? That’s right, Elafonisi Beach in the southwest has pink sands – there’s no wonder the Greek gem came out top in our rankings. 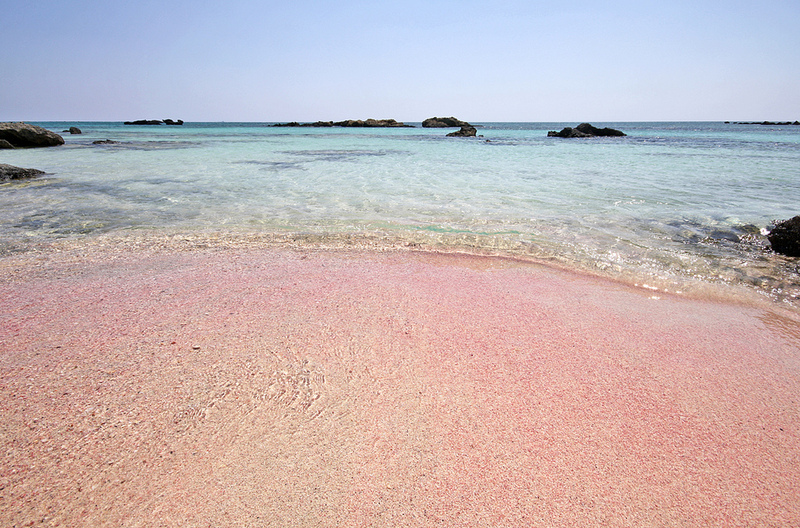 Elafonisi is Crete’s beautiful pink sand beach. Is there anything more exciting than going on holiday and trying out the waterparks? Crete has three great waterparks which are ideal for families – Watercity, Acqua Plus and Limnoupolis. At Watercity try out the fast-paced water slides and turbo tubes if you’re a thrill seeker, or if you’re after a more relaxed day out, the lazy rivers and wave pools are ideal. We may be all about the beach life, but we couldn’t share our love for this exciting island without mentioning all the great culture and entertainment on offer. The Maritime Museum in Chania Town offers a great history of the island’s maritime history and a shelter from the basking sun. The island’s streets are lined with souvenir shops for that little keepsake to treasure your time in wonderful Crete. Once the sun sets the island is still busy and bustling. There are plenty of clubs and bars to visit for the partygoers of the family – Malia is the clubbing capital of the island. For those seeking a more relaxed form of nightly activity, there are lots of Greek tavernas to head to for food, drinks and exciting entertainment. Gouves Water Park Holiday Resort – this four-star resort has three swimming pools, six waterslides and plenty of sports facilities to keep everyone entertained whilst staying in the resort. Blue Bay Resort and Spa – this four-star resort is only 200m away from the beach, has three swimming pools and a mini club – which has an indoor playroom, discos and hosts competitions. Mediterraneo Hotel – this four-star hotel has a seasonal mini waterpark, a relaxing spa and evening entertainment. You’ll never have a dull day here and there’s something for everyone to enjoy. Check out our Family Beach Index for more fantastic family friendly beach destinations.